Sherri Lane and I connected initially through my book, 30 Days of Gratitude. She became a fan of our Days of Gratitude Facebook page and began to regularly comment on our posts. We became friends on FB through our personal pages as well. While she was still writing her manuscript, Sherri called me to discuss her book cover. She believes in the power of visualization and wanted to have a compelling cover to encourage her as she was writing… to help her envision the book as completed. She even had the illustration she wanted to use, so it was a quick collaboration to create the cover. Writing can be a very solitary practice and it was an honor to assist her in bringing her book to the world. Sherri is an author who seeks to bring out the best in others by recognizing the good in the world. Through her own powerful spiritual experiences, she has felt led to share healing and glimpses of enlightenment to others, helping them walk in faith to a brighter place. Find out more about Sherri’s book at www.SherriLane.com. 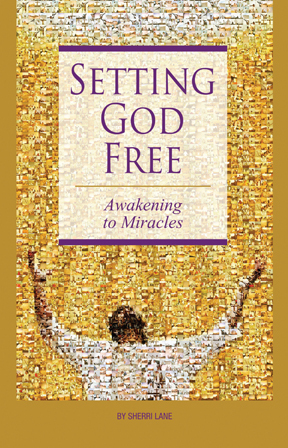 If you are in the Asheville, NC area, you may see Setting God Free in many of the area shops. You can also listen to an interview on Awakening Zone where Sherri talks about her book. Sherri also hosts her own radio show every Tuesday. You can listen here. Let me know if I can help you bring your book from concept to creation! Contact me at 678-521-8820. Find out more about me by visiting my LinkedIn profile or watching my video profile. This entry was posted on September 5, 2011 at 7:01 pm and is filed under books, graphic design, inspiration, spirituality, writing. You can follow any responses to this entry through the RSS 2.0 feed. You can leave a response, or trackback from your own site.